Monnalisa, the innovative horizontal milling machine for large structural aluminum aerospace parts. Crossbeams, wings and fuselage ribs, bulkheads and other aluminum structural aerospace parts are made by milling out large monolithic blocks, often over 1,5 by 3 meters, to obtain light and robust pieces. The removal times needed for these applications today represent a critical issue for the production process of an industry where the two major players, Airbus and Boeing, register several years of production backlogs. 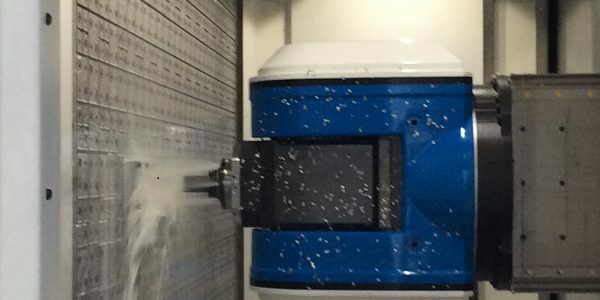 The demand for new 5-axis machining centers has been created to ensure high milling speed combined with precision, decrease the time and weight required by the parts handling, make easier the evacuation of the large quantity of chips removed. 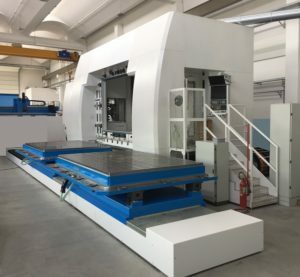 Comi has recently produced Monnalisa, the innovative 5-axis horizontal high-speed machining center specifically developed to meet these needs. A key requirement of a machining center for this application is to work with great robustness and precision, which is why the structure is entirely cast iron, all box-in-box, reinforced at strategic points to achieve maximum rigidity and dynamism with the minimal thermal drift. 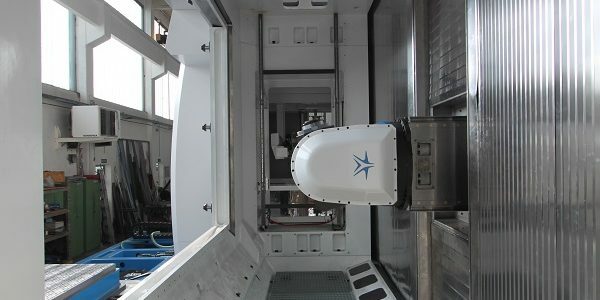 A great deal of attention has been paid to the axes movements, which is clearly appreciated by turning around the machine: the rigid double column X carriage has a Gantry configuration with two Twin Drive system for the backlash recovery through an electronic preload, Y and Z axis slide on roller sliding blocks, while the position of all axes is detected through pressurized and coded optical lines. To speed up the removal and reply to specific operating conditions, Monnalisa can be equipped with a spindle with 29 Nm torque for all aluminum parts or with 83 Nm torque that allows milling operations also on titanium. To ensure the highest efficiency of the core component of any milling machine, Comi has designed its own fork type working head with continuous movement, equipped with cooling through the tool, air blowing for cone cleaning and rigid tapping. Another big advantage is provided by the pallet change system that allows you to always work in masked time without ever stopping the machine: preparing and replacing a new piece takes place on the second table during milling of the part being worked inside the machine. Loading and clamping of the work pieces in the machine is also made less difficult thanks to the system designed by the Comi engineers: the piece is loaded easily and safely by the operator on one of the two steel plates, clamped by vacuum pumps or by an innovative “invertible” locking system or by traditional mechanical devices, finally positioned vertically due to the 90 ° rotation of the tilting table obtained by the two hydraulically operated mechanical arms. Milling of these blocks often involves cutting and removing 90% of the original weight: thanks to a large belt conveyor positioned under the working area, a volume of chips of about 1 m3 / hour is continuously evacuated, while a tank under the walkable grid allows to collect the copious coolant liquid. 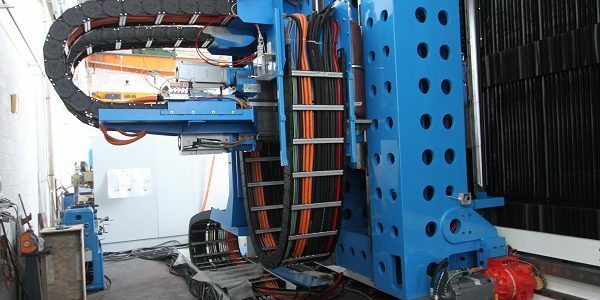 A large capacity tools warehouse (120 to 240 positions) and the high performance numerical control Siemens 840D SL complete the configuration of this machine that does not compromise on quality. 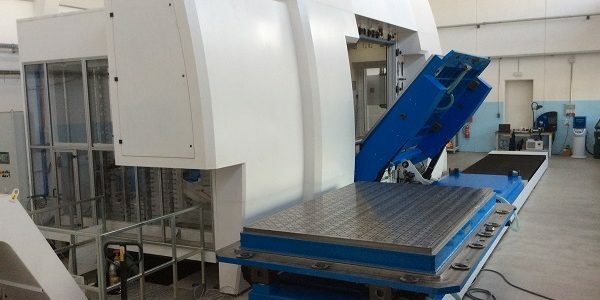 Another proof of Italian mechanical excellence able to compete with its global competitors says Pier Luigi Curatolo, CNC Milling Division Manager, which visitors to the Comi headquarters in Zingonia (Bergamo) where Monnalisa is installed are appreciating personally.